Noir Syndrome is a new game from Glass Knuckle Games (Thief Town, Dumble, Polygon Storm, Martin’s Descent, TANEIS, Aurel), developed by Dave Gedarovich. Since it’s procedurally generated, there’s not much of a story here – in the classic mode, you have fourteen days to find the killer around town. You do this by following leads, finding clues, and talking to people. At the end of those two weeks, you’ll either be dead, have caught the killer, or they’ll still be running loose. I have yet to catch anyone! The other way to play is the dinner party, where everyone in the house is a suspect. This mode (and the main mode, to some extent) reminded me of the game Sleuth, which I played all the time in college with my roommates. There’s no overarching plot at all though. There are no Steam achievements, but there are thirty in-game achievements along with Steam trading cards. The graphics are highly pixelated, but still charming and distinctive. People who don’t like pixel art/graphics will have to look elsewhere, but (as you know by now) I’m a big fan. Everything is well-animated and smooth, and there’s never a question of what you’re looking at. The only thing I’d say is that sometimes it can be a little busy in terms of what to search for on screen; some areas have a lot of hot spots. There’s no voice acting, but the soundtrack is wonderful and jazzy, and the sound effects are well-done. 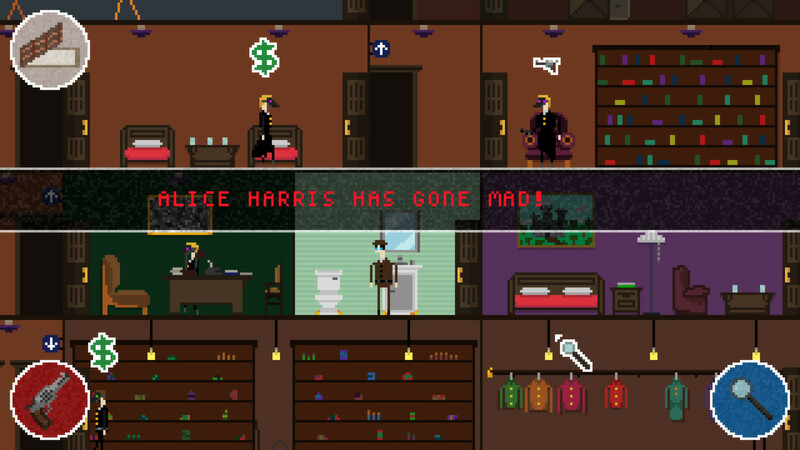 You’re able to pick between a man and a woman detective, which is awesome! You can also unlock more costumes with costume scraps that you randomly find around the area. In normal mode (which is what I’ve played the most of), you have two weeks to discover the killer. People will continue to be murdered as the suspect runs free, and you’ll piece together clues that you find at crime scenes and by interviewing the citizens. You also need to keep your detective fed, otherwise you’ll starve to death. Your only tool, besides your clue notebook, is your revolver, pre-loaded with two bullets. Use them wisely, because it’s hard to find somewhere to buy more. You’re able to buy lockpicks, which you’ll need a lot of to get through otherwise inaccessible areas. Every day, you pick a new area to investigate, and hopefully that area will give you another lead. 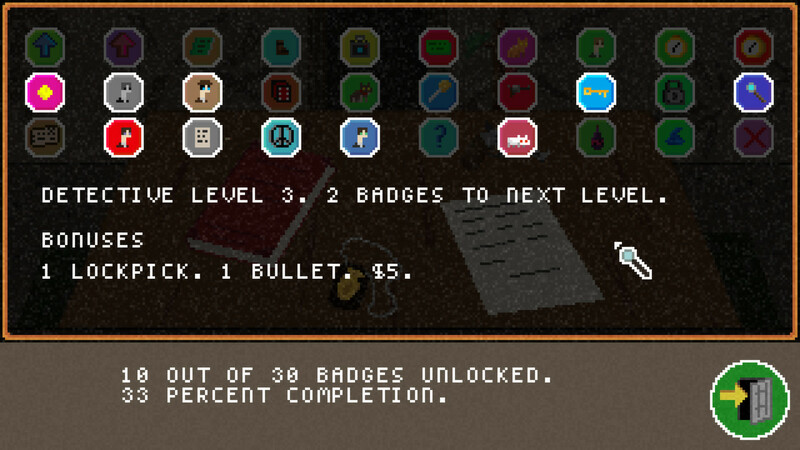 The game ends no matter what after fourteen days, but depending on what you accomplished, you can earn badges that will carry over to your next game. 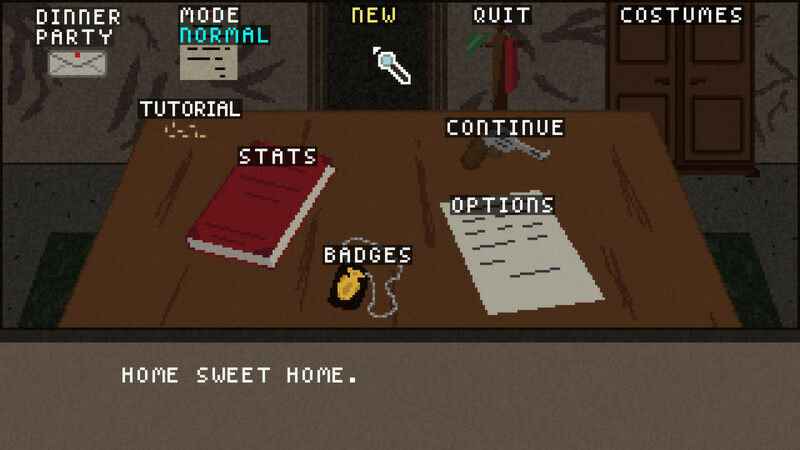 The game also keeps track of your stats, which is pretty cool. Noir Syndrome is an excellent game to play in short bursts, but lacks the depth that would make me play for hours at a time. 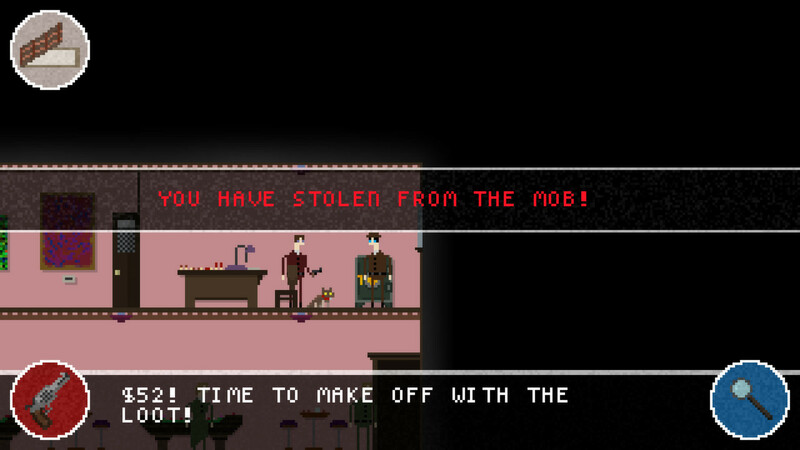 The game is absolutely worth playing though, especially if you like being a detective. Check out the official site, and like the team on Facebook, Dave’s Twitter, and YouTube. You can get the game on Steam, Desura, Google Play (only $2.99), or the official site for $6.99. If you buy from the official site, you can also get the soundtrack along with it for $9.99.